If you’re a professional dancer wearing pointe shoes all day long, you may experience some pain with pointe work. However, it is possible for pointe to be pain-free, especially for the beginner. If you have your shoes fitted correctly, and achieve the right level of strength and mobility, you shouldn’t be experiencing any real pain. Rain Francis teamed up with renowned dance physical therapist Lisa Howell of Perfect Form Physiotherapy to bring you this list of 8 ways to make pointe pain-free. Correctly fitting pointe shoes are absolutely essential. Once your feet have stopped growing, and have found a shoe that works for you, it may be more convenient to purchase them online, but for anyone who is still growing and developing, and especially for your first few pairs, make sure you see an experienced pointe shoe fitter, who has access to a wide range of styles. If the shoe is fitted correctly, it will be firm around the front part of the foot but should not be squashing your toes in together too much, as this can lead to ingrown toenails. If the box of the shoe is too wide, the foot will slide down into the box while en pointe, putting pressure on the toes, which can lead to bruised toe nails. If the box is too short it can cut in under the joint of the big toe and may contribute to the formation of a bunion. Always ensure that the wings of the shoe come up to the level of your big toe joint. As everybody’s foot is different, there is no one perfect shoe that is right for all dancers, and it is essential that all students at a school have shoes that specifically fit their individual foot type, even if this means that they are in different brands. Every student should undergo a pre-pointe assessment with a qualified practitioner, for example a physical therapist who specializes in dance, or a private lesson with a very experienced dance teacher. This is important to ensure that you have the required range and strength before you attempt pointe work. Otherwise, you risk injury and developing incorrect technique, which can take a long time to correct. Be patient – if you don’t pass your pointe assessment the first time around, listen to the advice from your assessor and work on all of the elements that are identified before your next assessment. It may only be another six weeks of sticking to your exercises before you are able to get your first pair of pointes! Refer to Lisa Howell’s The Perfect Pointe Book for some exercises that will really help with your preparation for pointe work. Ask your teacher for a structured program to improve your strength en pointe gradually. It is not just about being up on pointe or down on flat – it’s imperative to learn how to really articulate the foot in the shoe in every single rise and every tendu. Working through a graduated rise and being able to control your lowering is the most essential part of pointe work and will improve your strength and technique while helping to prevent injuries. For more information on this, check out the My Beginner Pointe program that Lisa developed with ex Australian Ballet Principal Artist Vicki Attard. 4. Use the right shoe for your level. The shoes you wear should be appropriate for your level of pointe work. As a beginner, while just working at the barre, a softer shoe will help you learn to articulate the foot correctly in the shoe. When you move into doing things like multiple turns in the center, a stronger, more rigid shoe may be more appropriate. As you progress further with your pointe work, you may find you need a few different pairs of shoes – a really supple one for barre work and softer, more Romantic solos; and a stronger, more stable one for center work, or stronger variations, which require multiple hops en pointe. 5. Look after your feet. Foot hygiene is extremely important, yet often neglected. If you don’t clean your feet and take care of your pointe shoes properly, you’re at risk of all sorts of nasties, such as blisters, ingrown toenails and fungal infections. Treat your toe pads or ouch pouches like socks: Remove them from your shoes and wash them frequently. You sweat a lot through your feet and wearing the same dirty pair of toe pads every day without letting them dry out can be a direct road to pain! 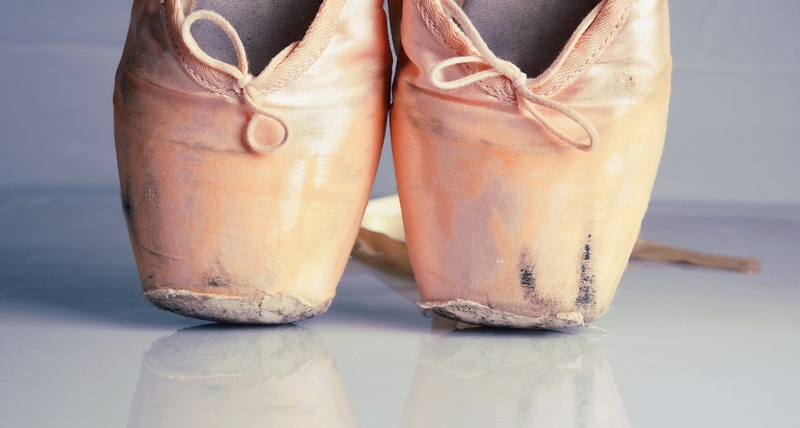 If blisters do develop, make sure you deal with them hygienically and cover them up for class rather than letting the raw skin rub on the inside of your pointes. There are many different options on the market these days, but when choosing padding for your toes, look for something that has minimal fabric underneath the toes. Too much bulk here can interfere with the placment and working of the feet. Any padding you use should be minimal. The biggest issue with pain en pointe is usually due to the toes clawing in the shoe, and the knuckles rubbing on the underside of the box. Most dancers then feel they need to put something in place to stop the rubbing. However, it is much better to deal with the clawing in the first place, by developing the articulation of the foot and strength to the correct muscles to keep the toes long in the shoe. Clawing indicates the incorrect use of the long toe flexor muscles which can lead to problems in the back of the ankle, such as posterior impingement. If your toes are clawing, focus on learning how to articulate the foot better during all aspects of class. 7. Keep your shoes strong enough. If you leave any padding in your shoes after dancing, the sweat may soften the glue of the box. This can cause the shoe to weaken and will result in your foot sinking down too far in the shoe. Always make sure to dry out your shoes thoroughly between each use, especially if you live somewhere that gets very humid. Having a couple of pairs that you cycle through during the week will help extend the life of the shoe, especially if you are dancing on pointe every day. You can also use a glue, such as Hot Stuff or Jet Glue to help re-stiffen the middle of the shank to extend its life. Also, each pointe shoe may have a few reincarnations; it may start off as a performance shoe, then become a class shoe, then a rehab/pointe exercise shoe, before finally the shank is pulled out and it becomes a demi pointe shoe for class work. Make sure you have shoes that are each stage, so you’re not using your stronger class shoes to do the really deep articulated exercises, especially when you’re doing more than 4 or 5 hours of pointe a week. 8. Pre-weaken your pointe shoes. Pre-weakening (sometimes called ‘breaking in’) your new shoes in the areas you want it to weaken will help to stop it from breaking in the middle of the shank. It is important not to cut the shank, heat it or wet it; these things may have been done in the past but are simply not relevant any more. Pre-weaken the shank in the demi pointe area a little so that you can rise through it correctly, and also soften in underneath the heel so that the shank can sit in close to the arch when you are en pointe. You can check out a video on how to do this here. Just using your feet to weaken the shoes can cause them to break in the middle of the shank, which will make you start sinking down and back into the shoes, meaning you’ll need to replace them more often. The shape of everyone’s pointe is different, so measure where the breakpoint is in your foot (where the heel becomes the arch) then weaken the shank of the shoe at this point so that it sits flat against your arch. It will feel better, look better and can also help extend the life of your shoe.